Irish scarf features a Celtic motif that is enhanced with Trinity knots. 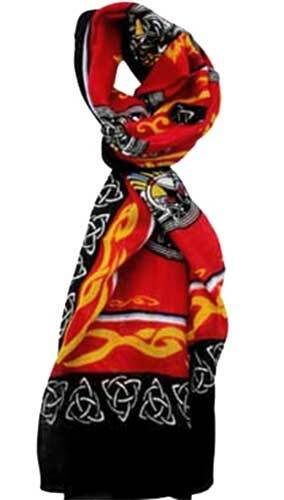 This red and black Celtic scarf features a design of Trinity knots and it would make an stylish accessory for any woman. The lightweight Irish scarf is made of rayon and measures 12" wide x 64" long. The Trinity knot scarf is made in Ireland by Liffey Artefacts and it is received with a Celtic knot history card, complements of The Irish Gift House.